Slowing the aging process has become a central public issue and one of the most talked about subjects in the past decade. Human experience, backed by many clinical research studies, has proven that faulty nutrition is the main cause of chronic diseases. As the body ages, physiological and biochemical changes occur that require our attention and adaptation. These changes include a decline in the body's ability to effectively absorb all the nutritional elements from food, a decline in the metabolic rate and in the body's ability to manufacture nutritional and biochemical elements, an increase in the rate of cell death and in the vulnerability of the cells to the damage of free radicals. Tailoring nutrition to the changing physiology of the body while supplementing it with suitable nutritional elements will reduce and even prevent a significant part of age related problems. Prime Time A.A. Formula is a specific and balanced formula that is rich in the most advanced natural high-quality nutritional elements. These provide a broad physiological response to inhibiting age-dependent processes, to preserving mental functions and the functioning of the body's systems and to enhancing outward appearance, all adapted to the needs of the older body. 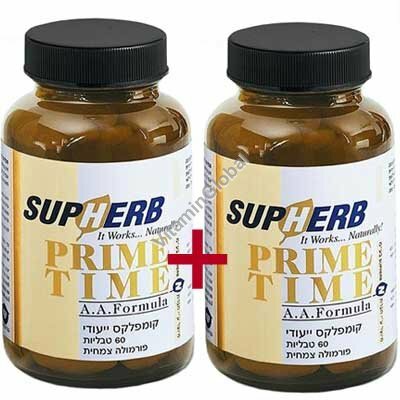 This formula provides the most sophisticated and advanced response to the aging process and enables those who take it to extend their biological time span to the maximum. Ingredients: Natural vitamin E, Coenzyme Q-10, Selenium, Pine Bark Extract, Green Tea Extract, Vitamin C, Japanese Power Mushroom Extract, Chromium Picolinate, Ginkgo Biloba Extract, Acetyl L-Carnitine, Vitamin B-12.